The interior of our earth is full of heat, noise, and movement— in a word, it is brimming with energy. To understand what is happening, we must consider the earth's structure; it consists of several layers in the form of spherical shells surrounding a core; the layers differ from each other chemically and physically. Figure 14.1 (a) A sector of the earth in cross section, showing the layers described in the text; IC is the inner core. Note the temperatures at different depths. (b) The outer part of the section in (a) enlarged ten times to show details of the crust and the rest of the lithosphere. Liquid and plastic (ductile) layers are hatched with broken lines. 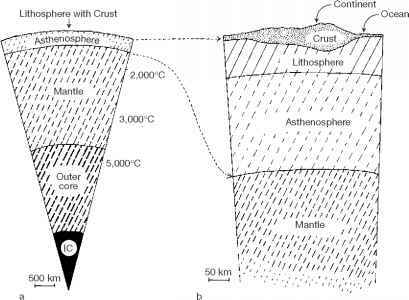 Note: The crust is classified as part of the lithosphere and the asthenosphere as part of the mantle. tinue: new discoveries are made frequently and new data recorded; methods of observation are being refined, and theories modified. What we are about to consider is very much work in progress. fleeted and refracted whenever they encounter temperature changes. Not surprisingly, data interpretation is difficult. Let's assume that all the difficulties have been solved and take a brief look at the current state of knowledge, realizing that revisions and extensions are coming all the time. Then we can ask, and try to answer, how and where energy is generated and (in the succeeding chapter) how it is ultimately dissipated. Generation and dissipation are equally important. Now for the earth's structure: simplifying matters considerably, the layers, from the surface downward, are as follows. The outermost layer, which is not uniform, is the crust: oceanic crust, under the ocean floor, is a thin layer of relatively heavy rocks—chiefly basalt— whereas continental crust, which underlies continents and continental shelves, is a thicker layer of less dense rock—chiefly granite and related rocks. Below the crust is the lithosphere. This is a layer of brittle rock broken into detached pieces, the tectonic plates; they slowly drift this way and that over the earth's surface. When they come together, the rim of one rides up over the other; the lower plate is forced down to great depths—it is said to subduct— while the leading edge of the upper plate scrapes off any sediments it encounters. The continental crust can be fairly regarded as the scum of the earth. Indeed, it is usually classified as merely the outermost part of the lithosphere. Below the lithosphere is the asthenosphere, a layer of soft, partly molten rock. It acts as a lubricating layer, enabling the tectonic plates above it to slide, or "drift," over the solid layer below it; there is more to be said about plate drift in a subsequent section. The next layer is the mantle. It is a ductile solid, consisting of silicate rock. 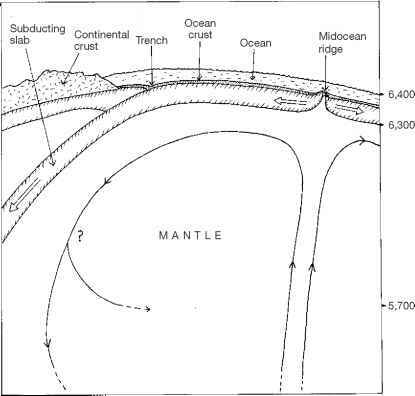 The asthenosphere, being merely the soft outermost skin of the mantle proper, is classified as part of the mantle in the same way as the crust is classified as part of the lithosphere. Below the mantle is the core of the earth. It has two layers, an outer liquid layer encasing an inner solid layer. All the way from the surface to the center, 6,370 km down, both the temperature and the pressure rise, abruptly at some levels and more slowly at others. Rising temperature melts rock if the pressure doesn't increase; conversely, increasing pressure solidifies molten rock if the temperature doesn't rise. When temperature and pressure rise together, the dominant factor alternates, which explains why hard, solid layers alternate with ductile or liquid layers. The layers differ from each other chemically, too. The mantle is made up mostly of silicates and the core of iron, which is much heavier. Across "our" surface, the difference in weight between a cubic meter of material above it (air) and a cubic meter below it (rock) averages 2,700 kg. Across the surface of the core, the difference in weight between a cubic meter of material above it (mantle rock) and a cubic meter below it (liquid iron) averages 4,330 kg. The latter pair of densities are current estimates, arrived at very indirectly. Not surprisingly, it's impossible to measure the density of rocks 3,000 km deep in the earth; the values have to be deduced from evidence of various kinds: from observations of the speed and direction of seismic waves; from the results of experiments carried out on rock specimens at temperatures and pressures far higher than any to be found at the earth's surface outside a physics laboratory; and by analyzing these data mathematically. Now imagine a visitor from outer space inspecting our planet, a more exotic visitor than the stereotypical little green man. Arriving with no preconceptions, and with senses wholly unlike ours, the visitor might reasonably regard the core of the earth as the solid planet, with the mantle and everything outside it forming a many-layered "atmosphere"; this would be as reasonable a separation as the one we are used to. The surface we live on seems to us the only one, but that is merely because we live on it. To repeat, it is a much less noteworthy surface than the core-mantle interface. The "inner planet"—the core—is slightly bigger than Mars. Its surface is believed to be as topographically interesting as the surface in our sense of the word, namely, the surface of the land and the floor of the oceans. Like them, the surface of the core has high mountains and deep valleys. Moreover, conditions are constantly changing at this inner surface, just as they are constantly changing, because of geological forces, at our surface. The changes are slow in human terms at both surfaces, but human notions of speed are irrelevant. Nearly all the material of the earth's interior, except (perhaps) the solid iron of the inner core, moves constantly. The tectonic plates of the lithosphere drift; the ductile material of the mantle creeps; and the liquid iron of the outer core flows. All this movement consumes energy, and the earth possesses energy of several kinds—thermal energy, kinetic energy, and magnetic energy. We begin by considering the thermal energy—heat—recalling that it comes from two sources: as explained in chapter 13, radioactivity is the primary source. An important secondary source is the residual heat remaining from the time of the earth's creation. As we noted in chapter 13, the earth's principal source of heat is a rather special kind of nuclear fission, radioactive a-decay; the radioactive elements of greatest importance in this context are uranium-238, uranium-235, and tho-rium-232. Radioactive elements are hundreds of times more concentrated in the crust than in the mantle; even so, fifty times as much heat is produced in the mantle as in the crust, because of the mantle's much greater volume. Although radioactive elements are more thinly spread below the crust than within it, the temperature continues to rise as the depth below the surface increases. But it rises much more rapidly in some layers than in others. Its rise is most rapid going down through the crust, and again 3,000 km below, across the boundary between the mantle and the core; this is the boundary of the "internal planet," where density increases so spectacularly, as we saw earlier. Between the thermal boundary layers, the temperature rises more gradually. 13, the concentrations of the radioactive elements in the earth's interior are forever changing. Before examining the consequences, we should investigate the reason for this perpetual change. Recall that an a-decay event (the emission of an a-particle) in a radioactive material is a chance occurrence, governed by probability. This makes it impossible to predict precisely when an individual radioactive nucleus will decay, but the probability that it will do so in, let us say, the next minute, or the next hour, or the next year, can be specified. The probability differs from one radioactive element to another: for instance, the probability that a uranium-235 nucleus will decay in a given time interval is far greater than the probability that a uranium-238 nucleus will. Therefore a ton of uranium-235 decays much faster than a ton of uranium-238. The speed at which each radioactive element decays is measured by its half-life, the time it takes for half a given number of nuclei of the element to decay. It makes no difference whether the quantity you start with is large or small; by the time one half-life is over, half of it will have decayed. The half-lives of the three radioactive elements most important in heating the earth are, for uranium-238, about 5 billion years; for uranium-235, 0.7 billion years; and for thorium-232,14 billion years. It follows that in the distant past all three elements were more abundant than they are now, and also that they must have been present in different proportions. For example, when the earth first came into existence, about 4.5 billion years ago, it must have contained slightly more than twice as much ura-nium-238 as it contains today, and the strongly radioactive uranium-235 must have formed a much larger proportion of the total radioactive material. It is believed that 2.5 billion years ago and earlier, in the period called Archean time, a number of strongly radioactive elements were present that have since decayed to the vanishing point: they have gone extinct. The amount of radioactive heat generated then was probably three or four times as great as that generated now.3 Regarding radioactive elements as a mixture of fuels, we can say that the total supply has dwindled considerably since the earth's early years and that some of the fuels are now wholly exhausted. Not all the earth's heat comes from radioactivity. Nearly as important (perhaps equally important) is the heat liberated when moving bodies—bodies imbued with kinetic energy—are brought to a stop. This happened in spectac ular fashion when the earth came into existence. A cloud of rock fragments, dust, and gas was drawn together by the pull of gravity and accreted into a solid protoplanet;4 as our protoplanet continued to grow, smaller, incipient protoplanets—large asteroids—that happened to be near, fell in on it and became part of it. All together, almost 6 x 1024 metric tons of material crashed into one big lump—the earth. The force of gravity caused the multitude of contributing chunks to accelerate to high velocities as they fell, acquiring high kinetic energies in the process. When these energetic bodies collided, nearly all their combined kinetic energy (not absolutely all, as we shall see below) was converted to thermal energy—heat. The total energy was about 2 x 1032 J; not surprisingly, the young earth melted. When this happened, gravity again intervened, sorting the mixture of liquids by weight. The denser, heavier liquids, predominantly molten iron, gravitated down to the center, leaving the lighter silicates to float to the top and form the earth's outer layers. The tidy arrangement of fluid material, with the heaviest at the center and the lighter farther out, is what caused the earth to change from an irregular lump to a sphere. The sinking of heavier liquids and the rising of lighter ones also released still more gravitational energy, hence more heat. Since Archean time, the earth has probably cooled several hundred de-grees.5 As the core cooled, the center, where the pressure was greatest, solidified first; in the outer layers, where the pressure was lower, the iron remained liquid. The outer core is still liquid, and as the planet keeps cooling the liquid continues to solidify, adding new layers to the inner core while the outer core thins correspondingly. In the act of solidifying, liquid iron loses some energy by liberating its latent heat of freezing (see chapter 10). This compensates for some of the heat being lost and slows the cooling. At the surface of the core, where the temperature drops sharply, iron continually crystallizes; the solid crystals then sink through the outer core and come to rest when they reach the inner core.6 This is still going on today, and it entails a continuing slow conversion of gravitational energy to heat; it is all part of an ongoing sorting process by which the earth's original ingredients, since they first accreted, have kept on shifting in a way that brings the densest material closest to the center. In brief, the earth's primordial heat, even while it is constantly radiating away into space, is still being generated at a modest rate. We still have some residue of the heat of creation. But inevitably, in time it will all be gone. As we've noted already, the earth is believed to have formed from the gravitational collapse of a cloud of rock fragments, dust, and gas. The cloud was part of a much larger spinning, disk-shaped cloud—the solar nebula—that was the precursor of the whole solar system. The sun, the planets, and all the other bodies of the system, as they condensed from the parent nebula, inherited its spin; they all rotate, each at its own speed. In the case of the earth, the speed of rotation is once every twenty-four hours, as we all experience day after day. Because it rotates, the earth has spin energy. The amount, close to 2 x 1029J (see chapter 8), is a mere one-thousandth of the thermal energy liberated when the earth came into existence. All the same, it is part of the total energy that was bestowed on this planet at birth. All the earth's energy is in the process of being dissipated; not to mince words, our home planet is steadily getting rid of its energy, shedding it, radiating it away. The way the 99.9 percent consisting of thermal energy is being shed is discussed in chapter 15. One of the ways the remaining 0.1 percent, the spin energy, is being shed is by tidal drag, as described in chapter 8. Drag is also going on deep inside the earth. The flowing liquid iron of the outer core gives the earth yet another form of internal energy, magnetic energy (see chapter 16). This energy too depends on movement powered by heat; it will steadily diminish as the heat is radiated away and the flowing iron slows and hardens. What does kinetic and thermal energy do to the earths crust?